PSYCH Season 7 Premiere Giveaway - Are You Screening? It’s that time again PSYCH-Os. 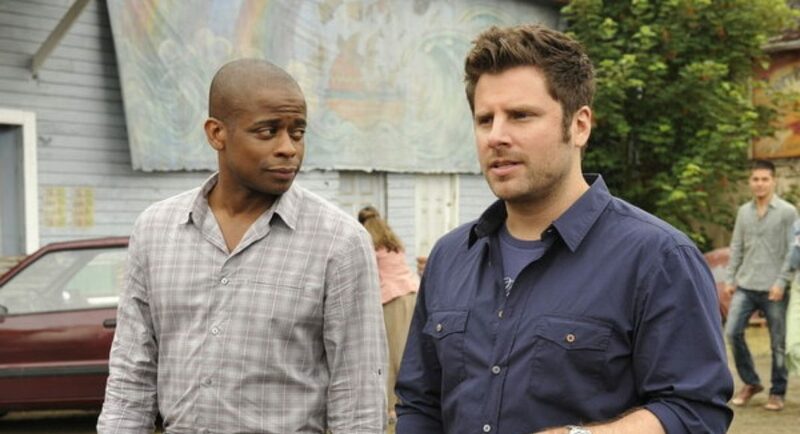 The seventh season of PSYCH kicks off tonight with the conclusion of last season’s cliffhanger. If there was any doubt about where we were headed last season, yes, Henry is in a very bad way, and the result leads to a very new perspective for Shawn. Also, don’t miss out on PSYCH The S#cial Sector, a new eight-week multiplatform murder mystery centering around an online reality competition in which contestants are sequestered in an unknown location and one contestant is voted off each week. When Shawn and Gus discover the eliminated contestants are turning up dead, they enlist self-professed PSYCH-Os to become their Digital Assistants and help find the location of the reality show’s house and catch the killer. Fans will help Shawn and Gus solve the case through a series of real-time communications, mini-games, crowding-sourcing challenges and an interactive Fan Theory Board where fans can post video responses to weekly challenges from the PSYCH characters. PSYCH-O’s can follow this parallel digital storyline via desktop or tablet at SocialSector.usanetwork.com and tweet using #SocialSector. Now that we’ve got all that out of the way, and you’re primed to get psyched for the new season, I have a very cool giveaway for you. 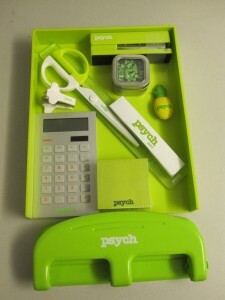 Basically, you’ll be the envy of everyone with a desk, office, or otherwise any need for a staple remover with this fantastic PSYCH desk set. Below check out a teaser and a clip from tonight’s episode, some more info on the new season, and enter to win. USA Network’s hit comedy series PSYCH returns with a spectacular season seven after a surprise season six cliff-hanging finale left fans of the hit show on the edge of their seats on Wednesday, February 27 at 10/9c. Fourteen all new episodes delve into the personal life of the very private Gus (Dulé Hill), sneak in a surprise wedding of one of our leads and push out new ‘Psych-isms’ to the devotees affectionately known as PSYCH-Os. Giving audiences a taste of Gus the romantic while revealing a jealous streak in Shawn (James Roday), the season features Parminder Nagra in a recurring role as Gus’ girlfriend. Guest stars include Katy Mixon, Garcelle Beauvais, Jeffrey Tambor, WWE’s Big Show, and the return of Cybill Shepherd and Kristy Swanson. Season seven will also feature the 100th episode of USA’s longest running series currently on air. To celebrate the series’ 100th episode, PSYCH will host a mini reunion of the popular 1985 movie “Clue” featuring original cast members Christopher Lloyd, Lesley Ann Warren and Martin Mull. The episode will also include guest stars Garrett Morris, Steve Valentine and returning guest star Curt Smith – of Tears for Fears’ fame – who will play himself. The long-awaited “PSYCH: The Musical” – an epic nod to the colorful word of musical theater – will showcase original songs written by show creator Steve Franks and performed by the entire cast with a host of impressive guest stars including Barry Bostwick, Brooke Lyons and Anthony Rapp.